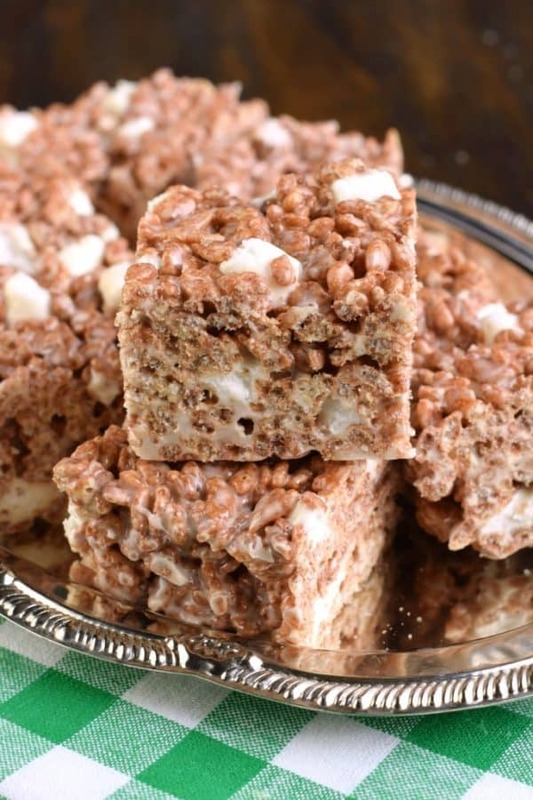 Get the tips and tricks to making the most PERFECT Cocoa Krispie Treats. Kid and adult friendly! THICK AND CHEWY! One thing you’ll learn about me if you spend any time on my website, is that I love Rice Krispie Treats. Yes, I make some incredible desserts. This Carrot Cake Cheesecake Cake is ridiculously good. These bites of English Toffee are amazing. But it’s the draw of the ooey gooey marshmallow that lures me in every time. 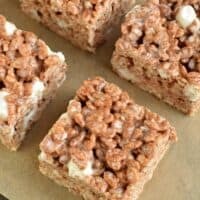 And I was shocked when I realized I had not yet shared a simple, but perfect, Chocolate Rice Krispie Treat recipe! If you want a Perfect Rice Krispie Treat, you are only one click away. I mean, if I’m going to be honest, my recipe gets RAVE reviews. Not only from strangers readers like you, but from family and friends who have tried my treat. There are definitely some secrets to success I’ve learned for how to make rice krispie treats. First, use a 9-inch square baking dish and line it with parchment paper (not foil. not wax paper). The size of the pan means that you’ll end with THICK bars, just like a fancy chocolate shop might serve. The parchment paper will keep it from sticking to the pan, and you can lift it right out to cut. Next, melt your unsalted butter in a large saucepan before adding marshmallows. 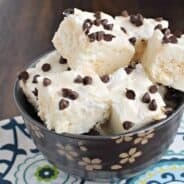 A few tips about the marshmallows. I prefer to use mini marshmallows as they melt quicker and more evenly. Also, use FRESH marshmallow. I can’t stress that enough. Don’t be pulling a bag of old marshmallows and think that it will work since you are melting them. Once your butter and marshmallow is melted, add your vanilla extract. Don’t skip. And make sure it’s PURE vanilla extract. Why waste your time on the imitation stuff that tastes like alcohol? Remove pan from heat and add in your cocoa krispies. Once you have mixed them so that they are completely covered, toss in another cup of mini marshmallows. 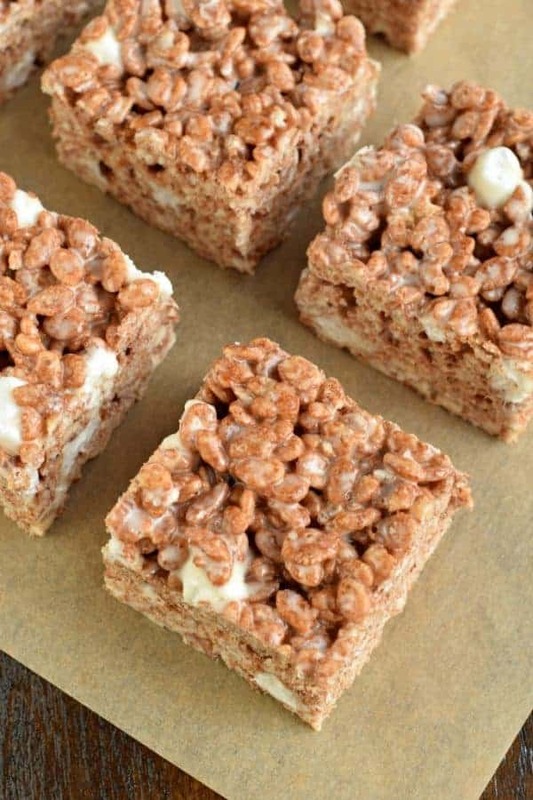 Because THAT my friends is how you achieve the perfect chewy krispie treat! Pour your mixture into your prepared square pan. Press GENTLY into the pan. Do not squish them in so hard…because guess why you’ll end up with? Yep, hard krispie treats. GENTLY press them into the pan. To keep your fingers from sticking to the treats, run them under cold water, and while they are still wet, press the treats. Repeat if they start to stick. Cover with plastic wrap and allow to set, about one hour. 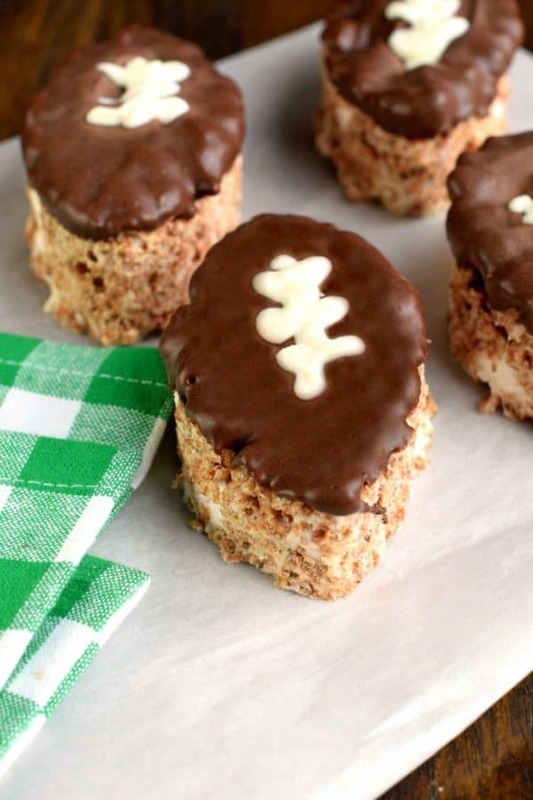 Whip up a game day touchdown with these adorable Chocolate Krispie Treats. Follow the recipe for chocolate crispy treats except press them into a 13×9 baking dish instead of a square dish. Using a football shaped cookie cutter, cut out your shapes. (I actually used an egg shaped cookie cutter that I bent into a football shape). Remove all the excess krispie treats (but don’t discard, eat it!!). Melt 1 cup of dark chocolate wafers according to package directions. Dip the top of the rice krispy treat into the chocolate and place it on parchment paper, chocolate side up. Melt 1/4 cup white chocolate. Once the football has hardened, melt the white chocolate and put it in a ziploc bag with the corner snipped off (for easy piping). Pipe laces onto the football. Allow to set, about 15 minutes. 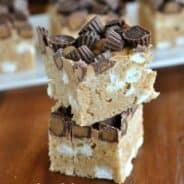 Chewy and delicious, these peanut butter white chocolate Avalanche Krispie Bars are better than the original. Copycat version of Rocky Mountain Chocolate Factory. 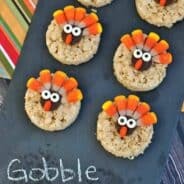 Easy to assemble Turkey Rice Krispie Treats decorated for Thanksgiving! Remove from heat and stir in the vanilla. Add the chocolate cereal and the remaining 1 cup of marshmallows. These treats are just perfect! 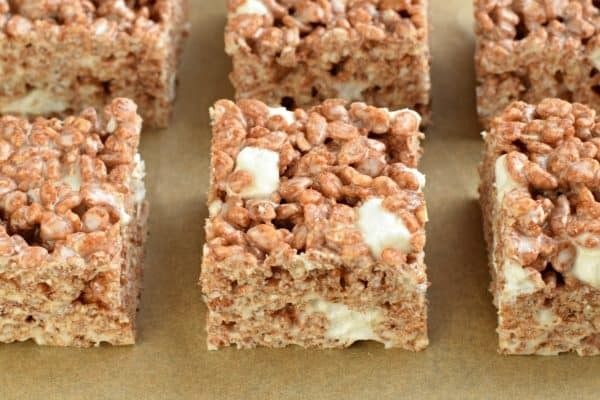 I love using the chocolate krispies for a change up to the regular, my family loves it! 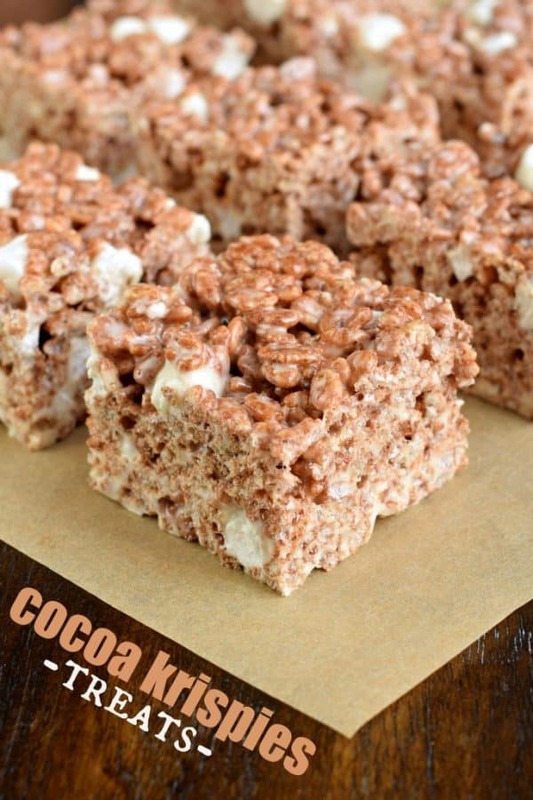 Love the chocolate rice krispies in this! Such a fun and yummy change from the original. These treats were a huge hit in our house! The whole pan was gone in minutes! I can’t wait to make them again. you had me at chocolate! While my footballs didnt turn out as cute as yours im sure they tasted just as good! fun recipe for the kids to make themselves. messy but fun! Your rice krispie treat recipe is the best! I love the chocolate version now too! How yummy these turned out! What a cute idea to turn them into different shapes for different holidays!